Stunning, beautifully appointed villa. Breathtaking Sea Views. Sandy Beaches. The house is of unique design and has glorious, uninterrupted views over the Ionian sea. The sitting room, open-plan diningroom and kitchen, together with cloakroom and utility room are all on the top floor and have a spectacular outlook. On the floor below are three light, airy and spacious bedrooms all overlooking the sea, and each with balconies and integral awnings giving protection from the sun. Two bedrooms have king-size beds and the third has two twin beds. The first king-size bedroom has it's own ensuite (full size bath, overhead shower, toilet and basin). The second king-size bedroom has an ensuite shower-room which can be shared with the twin bedroom. Each bedroom has fitted wardrobes, dressing table, occasional chairs and comfortable beds. The large mosaic swimming pool fills the front sun-terrace and there are shady areas in the garden particularly under the vine-covered pergola which is equipped with tables and chairs for eating and barbecueing. The villa itself is fully equipped for a maximum of six guests & offers high quality, tasteful accommodation with full air-conditioning and Internet connection. Meals can be enjoyed on the large top-floor oval balcony or below in the garden by the pool. From the house and garden guests can see miles of the Livathos coastline, the whole length of Lourdas Bay and the island of Zakinthos. Kefalonia has so much to offer. Visitors can chose to spend the day by the pool, laze on one of the local beaches or explore the island's sights before watching the spectacular Ionian sunset from the balconies. The Garden House is idyllically situated in an elevated position along a quiet lane. It is above the main Lourdas Beach and lies on the lower slopes of Mt Ainos - a protected National Park. Wild orchids flower in the spring, in the autumn crocuses and cyclamen bloom. Wild horses still roam the mountain and from the balconies guests may even see eagles, owls and bats! Please note that the guests' reviews listed on the HomeAway / Owners Direct website relate to when we ran The Garden House as a small guesthouse catering for B&B visitors. After many happy years we have retired and the villa is now let to guests wishing to enjoy a relaxed, self-catering holiday in our beautiful Kefalonian home. We now ask that guests use the existing visitor reviews purely as a guide to give a sense of what The Garden House, the delightful village of Lourdata, Lourdas Bay and the island of Kefalonia itself, have to offer by way of a wonderful holiday location. We are Lee & Graham, retired and passionate about all things Greek - its history, people and culture. We first discovered Kefalonia in 1999 and had been coming back regularly ever since. Then in 2011 we bought The Garden House which is situated in the area of Livathos. The scenery, views, beaches & walks are stunning. Forbes Magazine described Kefalonia as "one of the most idyllic places to live." Once you have visited the island yourself we think you will agree! There are double drive gates with private parking for up to two cars. The kitchen/dining room is fully equipped with cutlery, plates, bowls, serving dishes, utensils, bowls, saucepans, table mats, trays. Black granite work-tops. Fully integrated dishwasher, electric oven and induction hob. Kettle, toaster, microwave. Utility room - washing machine, large fridge/freezer, iron, ironing board. The stylish open-plan sitting-room/dining-room/kitchen is ideal for entertaining with two sets of french doors leading out onto the top floor balcony with it's breathtaking, uninterrupted sea views. We have a TV but not linked to any TV network. Therefore it is good for showing DVDs/Blu-Ray, gaming and linking to your devices with the correct connections. Notes on accommodation: Living Room.The large open-plan sitting/dining room has an open fire, french doors onto the breakfast balcony, uninterrupted, breathtaking sea, mountain & village views. There are books, games, TV, DVD & internet access. The large, infinity-edge swimming pool measures 9x4 metres with steps at the shallow end. The garden includes apricot, pomegranate, orange & lemon trees. Among the flowering shrubs are jasmine, plumbago, bougainvillea, roses & hibiscus. The garden is level with four steps to the two terraced areas at either side of the house. There are parasols, sun-loungers, tables, chairs and comfortable garden settee for guests' use. The Garden House is in a no-through road. As there is only one other house in the drive there is no passing traffic. At night the pool, gardens and gates are floodlit. The villa is a comfortable 25 mins drive to the bustling cosmopolitan capital, Argostoli with it's many restaurants, suprmarkets and waterfront where you will see the famous logger-head turtles and sailing boats. The airport is approx. 20 minutes drive but we are not on the flight path so there is no aircraft noise! we had a fantastic stay at the garden house- hosts lee and graham were amazing- so kind and caring and we had superb breakfasts which were different everyday with plenty fresh produce and homemade jams and compotes from the apricots and lemons direct from the trees in the garden. The views were incredible from the villa and the setting is so peaceful. our whole experience was first class and was made extra special by the warmth, care and knowledge of kephalonia that Lee and Graham provide. The standards of cleanliness were second to none too. we would be delighted to reccommend this wonderful b&B along with the opportunity to walk mia the spaniel - a home from home experience that we will treasure in our minds for a very long time. Our second visit here and in every way possible just as good as our first! Thank you Graham and Lee so much for your incredible hospitality and the genuine warmth you welcome. On a general note, the Garden House looked great in it's new paintwork and the view of the sea from the pool is stunning. Lee's breakfasts are fast becoming a thing of legend! What a wonderful place to stay! I first visited Kefalonia 4 years ago, and fell in love with the island - I just wish I had discovered The Garden House before last year. Lee and Graham are the kindest, most helpful people you could meet and I think pretty Mia must be the second most lovable dog in the world (my Abbie being the first). The rooms are spotlessly clean and comfortable with balconies where one can sit and look at the spectacular views. The flower-filled garden and pool are lovely. Lee's breakfasts are very delicious and varied - cereals, fresh fruit, yoghurt, honey and a cooked course among the choices. There are many good restaurants in the vicinity with a taxi fare of just a few euros. The beaches nearby are also very good. We hired a car for the duration of the holiday which we felt was neccessary to really see the island. I think our two favourite days were spent taking a boat trip from Skala beach to Ithaca and to Fiskardo - both with swim and lunch stops. I can't wait to visit again!!! Five star service, accommodation and location! Our family break at The Garden House can be described in one word: Superb. 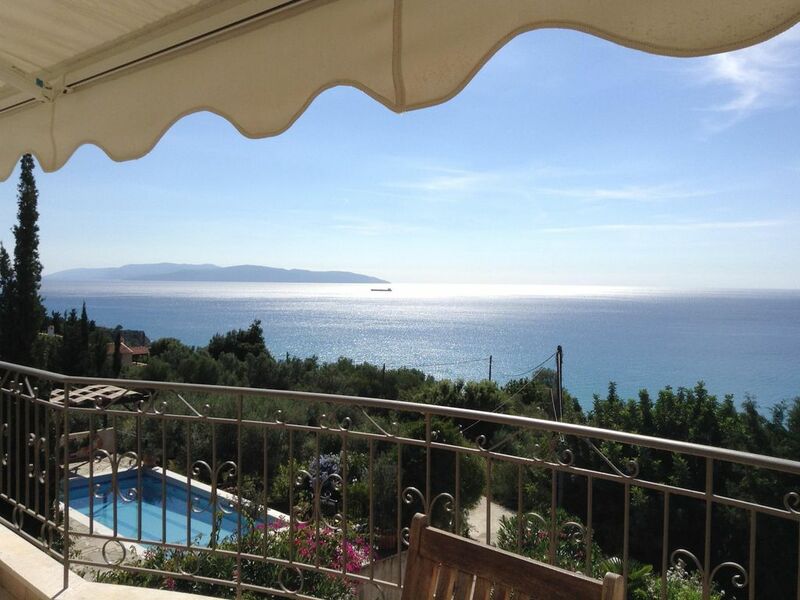 This was our second trip to Kefalonia, and from booking through to arrival and the duration of the stay, the service provided by Lee and Graham was second to none. They offered great advice on local amenities and things to see around the island and were always happy to help with anything that we had questions on. The villa itself was very well equipped and maintained to a very high standard- We occupied a double and twin room as a family of three with a shared balcony between the two rooms offering stunning views across Lourdata bay. A short walk takes you to a fantastic sandy, calm beach which, despite us going in high season, was never crowded and always had sun loungers available. There were many local tavernas within walking distance too and again, Lee and Graham were happy to give recommendations which meant we always dined in quality, friendly, local establishments. We took Lee and Graham's advice and rented a local car to view the whole island including Melissani cave and watching Sea Turtles in their native habitat in Argostoli. We honestly cannot recommend a stay here highly enough. The Garden House is a beautiful and secluded sanctuary and we had the most perfect week there. Lee and Graham are incredibly hospitable without being in the least bit intrusive and cannot do enough for you. Their knowledge and advice helped enormously with our enjoyment of the island. The property itself is modern and stylish and kept beautifully clean, with our room being cleaned and the bed made every day. The breakfasts are a thing to behold and kept us going for most of the day - and what variety! We did not have the same thing twice. The pool and gardens are also beautifully maintained and it actually felt like it was our private pool as we rarely saw anyone else when we were using it. We would thoroughly recommend this idyllic place and will be returning again when we can. The Garden House is 15 minutes walk to Lourdas Beach but longer coming back as it is uphill in places! There are many other sandy beaches nearby all of which are where the famous logger-head turtles nest in the summer months. Although the villa is not far from the beach and local tavernas, we strongly recommend that you hire a car. Walking in high summer when temperatures reach 36/38C. can be exhausting. A car is also important if you want to explore the island more fully. The villa is approx 20-25 mins drive from the airport and most hire car companies have cars available for collection and return at the airport. There are several well socked supermarkets in the village and larger stores 20 minutes' drive away. A welcome pack is provided on arrival at the villa and there are several local tavernas very close to the village church approx 10 mins walk along the lane. At the villa each bedroom and balcony has magnificent views of the sea, the island of Zakinthos, the garden and pool.The house is set at the top of a private drive shared with one other house, amid peaceful countryside of olive groves and woodland. There are incredible places to visit in Kefalonia all within a comfortable drive. These include the Omala Valley and Saint Gerasimos's resting place at the historic monastery there, Mount Ainos and it's breathtaking walking trails, the island's bustling capital town of Argostoli with it's fruit and vegetable markets and colourful waterfront, the port of Sami, charming Assos and cosmopolitan Fiskardo which makes for an incredible day out to the north-east coast! Everywhere there are beautiful safe swimming beaches - both sandy and pebbly - many with small tavernas, others with shady olive groves to picnic or majestic cliffs as a backdrop. There are many places to eat out - some a short stroll from the house, others along Lourdas Beach, also in country villages, in Argostoli itself or along the waterfront of harbours and ports.